What types of lung tumors are there? "Most primary lung cancers originate from the epithelium lining the airways." Most primary lung cancers originate from the epithelium lining the airways. 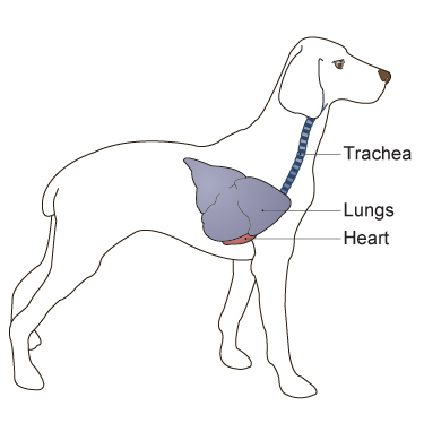 In dogs, most develop in the alveoli where oxygen is taken up into the body, but in people and in cats most originate in the main airways (bronchi). The point of origin is often difficult to determine and tumors may be multiple. Benign lung cancers (adenomas) are very rare and usually do not cause illness. They are probably part of a progression from overgrowth (hyperplasia) to malignancy. Malignant cancers (carcinomas) spread within the lung through airways, blood and lymph vessels. They also spread (metastasize) to the pleura (covering) of the lung and to regional lymph nodes. Some tumors progress further with metastases (secondary tumors) in bones and other parts of the body. A few cancers start in neuroendocrine cells, which produce chemicals called hormones that have actions in other parts of the body. A few also originate from connective tissue cells or the pleura of the lung (mesothelioma). The lungs are also one of the main sites in which metastases from tumors of other parts of the body grow. These secondary or metastatic tumors are sometimes difficult to distinguish from multiple tumors originating in the lung. Cancer is non-lethal genetic damage of cells (mutations in the DNA genome). Mutations have been found in canine lung cancer with upsets in the normal regulation of cell death and replacement. Little is known about the causes of these mutations but, as in people, some chemicals may be involved in initiating or promoting the cancers. There is a type of lung cancer in sheep that is due to infection with a virus. Lung tumors are rare in animals. Lung cancer in California has been estimated at a population incidence of 4.2 per 10,000 dogs per year. The incidence in cats is slightly higher. The average age of dogs with primary lung tumors is 10 years and they are rare in dogs less than 6 years of age. In cats, the average age is 12-13 years. Most tumors are in the lung lobes furthest from the head in both dogs and cats. More than half of dogs with these tumors cough. A quarter of them have breathing difficulties and some are lethargic with about one in eight showing loss of weight. A quarter of dogs that turn out to have lung cancer are brought to their veterinarian for clinical signs unconnected with respiratory disease. Clinical signs in cats are similar but are more likely to include weight loss, lethargy and loss of appetite. Cats may be lame due to bone metastases and most cats are anemic. "X-rays of the chest are the most useful diagnostic aid." X-rays of the chest are the most useful diagnostic aid and demonstrate tumors in approximately 3/4 cases. In order to identify the tumor type, it is necessary to obtain a sample of the tumor itself. 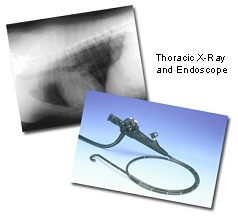 In order to obtain the appropriate tissue samples, your veterinarian may recommend various sampling techniques, such as trans-tracheal washes, fine needle aspirates and surgical biopsy using bronchoscopy or exploratory surgery. Cytology is the microscopic examination of small samples of cells from washes and needle aspirates. This can identify 20-25% of lung tumors. Histopathology is the microscopic examination of specially prepared and stained tissue sections. The information from this examination is more detailed and reliable than cytology. Your veterinarian will place the samples in a preservative solution and submit them to a specialized diagnostic laboratory for processing and evaluation by a veterinary pathologist. The pathologist's report typically includes the name or type of tumor and a prognosis, which will predict how the tumor will likely behave. "Surgical removal of the affected lung lobe is the most common treatment." Surgical removal of the affected lung lobe is the most common treatment. Small, solitary tumors in dogs are often cured by this surgery. Chemotherapy has been tried in dogs with inoperable tumors, but the results are not encouraging. Cancer very rarely disappears without treatment. Very occasionally, spontaneous loss of blood supply to the cancer can make parts of it die. The body's immune system is not effective in causing lung tumors to regress. After surgery, you should prevent your pet from interfering with the operation site, which needs to be kept clean. Any loss of stitches or significant swelling or bleeding should be reported to your veterinarian. If you require additional advice on post-surgical care, please ask. The histopathology report will give your veterinarian the diagnosis that helps to indicate how it is likely to behave. The veterinary pathologist usually adds a prognosis that describes the probability of local recurrence or metastasis (distant spread). Surgical removal of the affected lung lobe may cure small, solitary tumors in dogs. In one survey, 72% of dogs so treated went into remission. However, dogs with recurrence had average survival times of only 28 days post-surgery. The regional lymph nodes (glands) are often examined, because if the cancer has spread to the nodes at the time of surgery, a successful outcome is less likely. Surgical removal of the affected lung lobe is also the treatment of choice in cats but less successful because there is usually more extensive disease, metastasis or the cat also has concurrent heart disease. Some features of the histopathology examination indicate whether your pet is likely to have a better prognosis. These include how close the appearance of the cancer tissue is to normal tissue, and whether there is microscopic evidence of spread to the lymph nodes. In general, squamous cell and anaplastic carcinomas have a higher rate of metastasis than adenocarcinomas. "In cats, these cancers frequently metastasize to bones, particularly those of the toes." The cancers can spread within the lung and elsewhere, so return of the original signs of illness may indicate the tumor has returned. In cats, these cancers frequently metastasize to bones, particularly those of the toes.